Low-income mothers with newborn babies and moms-to-be will receive a special gift for their newborn. Layettes are designed for infants zero to three months of age, and provide some of the essential items necessary to take care of a newborn baby. Our layettes include items such as receiving blankets, clothing items, baby bottles, diapers and other accessories, all packed into a “ready-to-go” diaper bag to help mom with baby’s first journeys. FOCUS -Friends Of Children United Society, a Coronado based group, provides the necessary funding for the project. A recent donation of new born items from St. Catherine Laboure’s Women’s Club created 39 Baby Bundles to supplement the layettes provided by FOCUS. 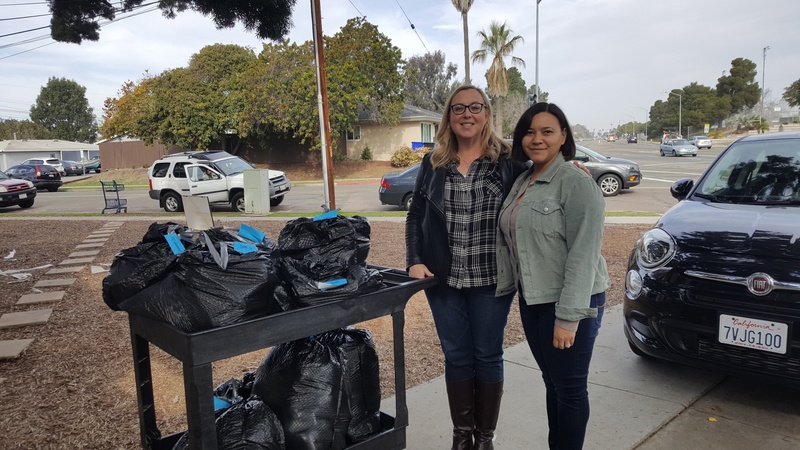 They were assembled by Betty Jones and Janine James, who currently volunteer at the intake desk at our Clairemont Center. They have now added a new title to their name tags, namely “CCSA Baby Bundle Lady.” Thank you to our friends at St. Catherines’s and our two dedicated volunteers for caring about our youngest clients. In the future donations to the program from various groups will emphasize items for older infants.